PHOTO BY TAMMY KREGEL Sophomore wing Annaka Hall pressures a William Blount player in Bearden's rough and tumble 61-57 win last week. Coming off a 10-day layoff after winning its Super 16 holiday tournament, Bearden High’s unbeaten girls team showed up for a basketball game Tuesday, Jan. 10, and Roller Derby broke out. At times, bodies were flying everywhere. Visiting William Blount, known for its hectic and chaotic style of play, battled the Lady Bulldogs from start to finish but couldn’t knock them from the unbeaten ranks. Bearden, No. 6 in The Associated Press’ Class AAA state poll, overcame a five-point deficit in the third period and turned back the Lady Governors 61-57. Todd Wright, William Blount coach, said the plan was to wear down the Lady Bulldogs by subbing in four or five players at a time frequently throughout the game. But Bearden didn’t wilt and made 14 of 18 clutch free throws in the fourth quarter to hold off the Lady Govs. With the win, Bearden boosted its record to 14-0 overall and 5-0 in District 4-AAA. 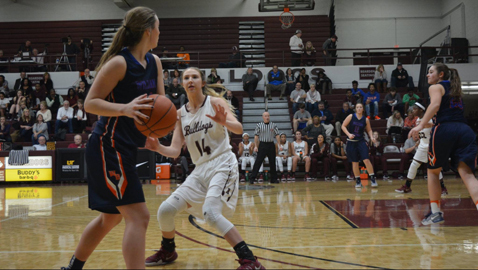 The Lady Bulldogs made it 15 straight with a 68-30 romp at Lenoir City the following night and were scheduled to host rival West Friday night. Sophomore wing/post Shekinah McLaughlin made six of six at the line in the final period and led Bearden with 13 points. Senior point guard Jalia Arnwine added 12 points, junior point guard Trinity Lee 10 and junior post Grace van Rij nine. William Blount, which slipped to 12-6 overall and 3-3 in the district, got a game-high 16 points from senior post Abbey McGuire, 14 from sophomore forward Alyssa Walker and 12 from junior guard Lexi Campos. The Lady Governors made only 9 of 16 free throws but fired in a dozen 3-point shots. For much of the game, William Blount got its points by shooting over Bearden’s 2-3 zone. Underwood extended the zone late in the third period. “Normally, we play two posts, but we went four guards and one post at times to extend out there a little better,” he said. Campos, who made three treys, pulled the trigger from 25 feet on some of her attempts. Bearden fell behind early but recovered to take a 12-10 lead in a physical and rough first period. It was 25-all at halftime. Senior Kenzie Thompson’s 3-pointer from the right wing gave William Blount its biggest lead (34-29) in the third. A trey on the left wing by Lee and Kendall Clark’s basket from the base line pulled Bearden even. The Lady Bulldogs hung close and Annaka Hall’s layup gave them a 43-41 lead heading into the final quarter. Rij fed Tytiaira Spikes for a basket inside to give Bearden a five-point lead (46-41) with 6:55 to go. The Lady Bulldogs never trailed again, but McGuire drilled a 3-pointer from the left corner with 2.9 seconds left to make it interesting. The Lady Govs fouled before Bearden could put the ball in play, but Rij sank the first of two foul shots to make it a four-point lead. In the previous four seasons, Bearden twice reached the state tournament and was 27-7 after bowing in the sub-state last year. “We lost three seniors who had been part of the most successful run in Bearden girls basketball history,” said Underwood, who is in his sixth season as head coach. “We’re filling those spots well. We have kids who work hard and play hard. We have a lot of kids who have college potential. “We’ve got three seniors,” added Underwood. “They are kind of the unsung heroes of the group. They do a lot of the dirty work if you will and maybe are not as accolade heavy, but they’ve still been huge for this team. Since I’ve been here, this is the best record we’ve had at this point in the season. Bearden will host Maryville Tuesday night as the second half of district play begins. The Lady Bulldogs will play at arch-rival Farragut Friday.